We usually think of children as our future, but recently my son gave me a new perspective. On Father’s Day, my husband wanted to take a picture with his father and son. He said that it was a picture of the past (grandfather), present (father), and future (son). He thought that our son was the future, because our son has his life ahead of him. “No, I’m the past!” our then 7-year old son argued. “Gung-Gung [grandfather in Chinese] is the future!” To our son, he was the past, because he will grow up to be a father and grandfather. 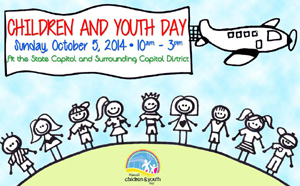 * On October 5 on the Hawaii State Capitol grounds, 10 am to 3 pm, celebrate Children and Youth Day with sports, fitness, games, crafts, and educational activities. Admission is free, and so is parking at nearby municipal parking lots. There are also free State Capitol tours, free admission to ’Iolani Palace, and free guided tours of the King Kamehameha V Judiciary History Center. * On October 10 at the Hawaii State Capitol Auditorium, the Hawaii State Legislature will host the 21st Annual Children and Youth Summit, “Hope for the Future.” The summit’s goal is to identify critical issues facing Hawaii’s keiki and discuss solutions. Registration is required and is limited to the first 300 registrants. * On October 11 at the Kenolio Recreation Complex in Kihei, Maui, 3 to 8 pm, celebrate Maui Children and Youth Day with activities and entertainment for the whole family. * On October 17 and 18 at the Ala Moana McCoy Pavilion, 6 to 9 pm, listen to Hawaii’s best storytellers and mainland guests at the 26th Annual Talk Story Festival, presented by the City and County of Honolulu Parks Department. * On October 26 at the Bishop Museum in Honolulu, 10 am to 2 pm, Kids Fest is a day of health and wellness, with interactive games, activities, and prize give-aways. Let’s take a moment to look at children as the people we used to be – full of wonder, curiosity, and possibilities — and who we can be again. In the spirit of Smithsonian Museums, which offer free admission everyday, Museum Day Live! is an annual event hosted by Smithsonian magazine in which participating museums across the country open their doors to anyone presenting a Museum Day Live! ticket… for free. To get your Museum Day Live! tickets, good for free admission for two people on Saturday, September 27, simply register for a Smithsonian account, request a ticket, and download it immediately. You must print your ticket (or have it accessible on your mobile device) and present it at the entrance. * ’Iolani Palace, the only royal palace in the United States, and last official residence of the Hawaiian monarchy, restored and open to the public. * The Hawaii State Art Museum, an art museum with three galleries and a permanent display of Hawaiian art, including a Sculpture Garden. * The Pacific Aviation Museum Pearl Harbor, an aviation museum focusing mainly on the attack on Pearl Harbor on December 7, 1941 and World War II, with a collection of vintage aircraft, educational videos, and a combat flight simulator. * The Japanese Cultural Center of Hawai’i Historical Gallery, a historical exhibit titled “Okage Sama De: I am What I am Because of You,” which reveals the Japanese experience in Hawaii, from immigration in the 1860s to modern times. * Hulihe’e Palace, a museum that showcases Victorian artifacts from the era of King Kalākaua and Queen Kapi’olani. * Lyman Museum, a natural history museum with Hawaiian culture displays and a collection of shells and minerals. * Hale Ho’ike’ike Bailey House Museum, a historic house museum of Hawaiian history and art, as well as historical papers and native Hawaiian gardens. * Grove Farm Museum, an authentic sugar plantation and homestead with original furnishings, Hawaiiana collections, and steam locomotives, surrounded by fruit orchards and pasture lands. Print out your ticket and visit a museum this weekend! This week is National Drive Electric Week, a week-long celebration of all-electric and plug-in hybrid-electric cars, trucks, motorcycles, and other vehicles, sponsored by Plug In America, the Sierra Club, and the Electric Auto Association. In Hawaii, there are over 2,300 registered electric vehicles and over 300 charging stations. I’m one of them; I have a Nissan Leaf, and I love driving it. It is quiet and easy to drive, and I don’t have to pump gas or worry about oil changes. I charge my car at night. I admit to having “range anxiety” (can I make it home? ); but this means that I plan my trips more carefully, and often wait until I have multiple errands to run before driving further away from home. * On September 14, there was an event at the Kahala Triangle Park in Honolulu, Oahu. * On September 20, attend an event in the Kukui Grove Parking Lot in Lihue, Kauai. * Print out an “Oil-Free Miles” sign, write your current mileage at the top, and display it proudly. * Sign the Sierra Club’s “letter to the governor” encouraging more support for electric vehicle infrastructure. 1. Can you afford it? Your upfront costs will be higher – an electric vehicle is more expensive than a gas vehicle. It requires charging, so your electricity bill may be higher (unless you have a photovoltaic system). But you’ll save money on gas and oil changes, get free public and airport parking, and get to use the high-occupancy vehicle (car pool) lane in Hawaii. 2. What are your driving habits? Think about how far you drive every day, whether you drive on level streets or mountain roads, and how much patience you have to recharge your car. Older electric vehicles have a driving range of 60-100 miles; some newer electric vehicles have a range of up to 250 miles. And while filling up a gas tank takes only minutes, charging an electric vehicle could take from 30 minutes (480-volt fast charger), 4-8 hours (240-volt outlet), or 10-20 hours (120-volt ordinary household outlet). * Visit the Hawaii State Energy Office for a list of Hawaii charging stations, links to resources, and information about state and federal laws. * Read the “Plug-in Electric Vehicle Handbook for Consumers” (2011) from the US Department of Energy, a good introduction to plug-in electric vehicles. * Read the “Hawaii EV Ready Guidebook for Commercial Electric Vehicle Charging Station Installations” (2012), that helps businesses install successful charging stations. Do you drive electric? If you have an electric vehicle, what do you like about it? If you don’t have an electric vehicle, what stops you from choosing electric? Most company logos are designed to be read quickly and easily, with fonts and graphics convey a sense of the company’s stability, trustworthiness, or creativity. A few logos go beyond function, invoking emotions, ingenuity, and visual interest. Let’s take a moment to appreciate some of the Hawaii companies whose logos combine business and art. Note: This is not an endorsement of the companies, products, or services; it’s an appreciation of their logo design. HILife and the Hawaiian Legacy Rainforest cleverly incorporate the outline of the Hawaiian Islands in their logos. HILife arranges the Hawaiian Islands as the branches of a tree, while Hawaiian Legacy Rainforest envisions the Hawaiian Islands as the toes of a foot. The logos for Hawaiian Airlines, Island Slipper, Cake Works, and Kōloa Rum Co. invoke a sense of nostalgia. Hawaiian Airlines’ logo features a woman with a hibiscus in her hair, her face turned towards and part of a leaf, in bold colors. Island Slipper’s logo shows Diamond Head, coconut trees, and a red-sailed canoe. In Cake Works’ logo, a woman showcases a cake (naturally). Kōloa Rum’s logo features a finely-detailed drawing of a plantation house surrounded by coconut trees. Down to Earth, Tropical Gardens of Maui, and ’I’iwi Kona Coffee Co. have turned their logos into small works of art. Down to Earth’s logo features crates of fresh fruit, with Diamond Head in the background. Tropical Gardens of Maui shows Maui’s mountain ranges bordered by colorful plumeria and hibiscus. ’I’iwi’s earth-tones logo shows the spread wings of the endangered ’i’iwi bird, wings outstretched, to form a pearl or moon above a red plant with green leaves. I also like the Great Aloha Run’s fun, frenetic logo with bright colors and energetic lines; and Waimea Valley’s breezy, free-flowing logo, with its subdued colors, mountains that form a subtle “W,” white sail, and swirling ocean. What do you like about your favorite business or organization logos? Which logos do you consider classic or iconic? 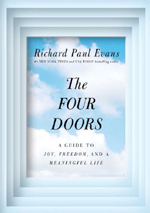 The book is based on three founding truths: 1) we all have the freedom of self-will, 2) we are born with a purpose, and 3) personal change is both possible and inevitable. It teaches us that we first need to change our attitude toward hardships and failures. 1. PURPOSE. Believe there’s a reason you were born. Sometimes our purpose is given to us; sometimes we find it by following our passion or listening to our inner voice. 2. IMAGINATION. Free yourself from limitation. Imagine a better life. We have to overcome our negative belief, self-doubt, and fear of failure. We have to take control of our lives (don’t think of yourself as a victim! ), learn from adversity, offer forgiveness, and feel gratitude. 3. VISION. Magnify your life. Have a dream. Ask “what if?” and “why not?” Take risks. 4. LOVE. Develop a love-centered map. Love that wishes good for someone else is an act of will and a skill to be developed. “Love is the destination and the journey” (page 138). The fourth door leads to all others. What doors have you walked through? What door will you walk through today? You awake alone in a new world. You can explore your world, but you must find food and shelter before night falls. To survive, you must defend yourself against monsters and wild animals. To thrive, you must dig for resources and craft tools and weapons. Welcome to the world of Minecraft. My 8-year old son loves the game Minecraft. Peering over his shoulder, I couldn’t understand why. I’m more of a Tetris, Scrabble, Candy Crush game player myself. But I made a deal with him with summer and tried Minecraft for the first time. But it helped me appreciate why he likes the game so much. As I soared over this strange world, I realized that it was teaching him more than just hand-eye coordination. 1. We control our future. We are born (spawned, if you will) with everything we need to succeed in a new world. 2. We must plan what we need – and prioritize. In survival mode, we must find the basics (food and shelter) before night. We can follow crafting recipes to create new items, but we must have all of the raw materials. In creative mode, we can use our imagination to build mansions, roller coasters, entire cities, and more. 3. The world is endless. Our lives are full of beauty – and danger. It’s easy to get lost unless you have a reference point. 4. The world has limited resources. In survival mode, we have to conserve our natural resources (trees and metals), plant crops (such as wheat and apples), and manage livestock (sheep, chickens, pigs, and cows). 5. Friends are important. Tame a wolf, and it will be loyal and attack our enemies. Tame an ocelot, and it will help us ward creepers away. Tame a horse, and we can saddle and ride it. 6. If we don’t have it, we can barter for it. We can trade with villagers or ask other players for what we need. 7. We must police ourselves. We can steal items from villagers’ houses or even harm villagers – and there is no police to stop us. We must decide what is right and wrong for ourselves. 8. Everything can be used. Nothing is wasted. We use natural resources to build, and if we break down something, it goes back into inventory – it can be recycled, reused, or repurposed. What video games did you enjoy as a kid? Looking back, what do you think they taught you? What games to you play today? You are currently browsing the Better Hawaii weblog archives for September 2014.